Must have passed FOUNDATION COURSE conducted by the Directorate of Art, Maharashtra state, Mumbai. Must have passed H.S.C. examination (12th std) conducted by the government of Maharashtra State Board of Higher Secondary Education and Intermediate Drawing Grade Examination conducted by the Directorate of Art, Maharashtra state, Mumbai. Application for the admission should reach the Dean, Sir J. J. School ,Mumbai 400001 within 7 days or given date of admission. 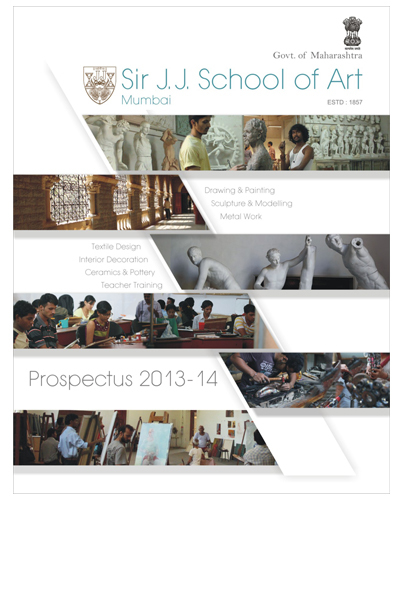 Must have passed Diploma/Degree in Drawing & Painting or Sculpture & modeling or Applied Art. Applications for the Diploma/Degree courses along the copies of relevant certificate referred to the form of application for admission should reach the Dean, Sir J. J. School of Art, Mumbai 40001 within 7 days from the date of declaration of above Diploma or Degree, result of Maharashtra State. Must have passed Art teacher,s Diploma and minimum 3 years Art teaching experience.They should submit their application through Head Master of School along with attested(true)copies of the proper certificates in given date of Admission Form. Merit List for the Admissions for A.T.D.,A.M. Cert. and Dip, A. Ed. will be declared and put on the Notice Board of the institute. No postal correspondence will be entertained.